On one hand I’m excited to be writing this blog post because September was an exciting month – business wise – for my wife and I. On the other hand I laugh in embarrassment because I didn’t even think of writing this income report till yesterday. It almost slipped my mind. Which probably explains why my previous post was August’s’ income report. I guess that says a lot. This blog simply does not have the priority to me that it perhaps should have – thanks to more exciting other ventures – more on that later. I do need to get back to documenting my SEO strategies on here though because I KNOW some of you greatly appreciate when I share case studies and the income does tend to reflect my efforts as well. For now though, let’s break down how much money this blog made in September. IMPORTANT: I never include earnings from ventures unrelated to this blog. I own and am a partner in a bunch of online business ventures, but – for the sake of a fair case study – only earnings directly related to SEODagger.com will be shared. 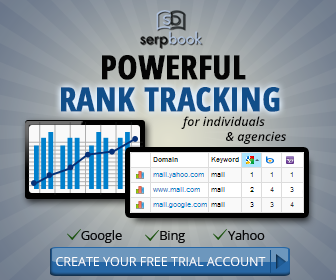 With that out of the way, how did SEODagger.com do? If you read last month’s income report you will remember me mentioning that it was my highest earning month from these guys – ever. It was exciting. I didn’t expect the blog to beat the record in September again, but it did. Yay! I am expecting to earn less with them this month though simply because I don’t think the page now ranks as high as it did 3 weeks ago. I’ll explain in the expense section why. I know there were likely a few sales for my Samson Elite plugin that came through this blog, but as promised a few months ago, I will stop tracking them here. Same as the previous month, I ordered a handful of PBN links to link to the MyeCoverMaker.com review post at the very beginning of September. I had bought many links from this person in the past and knew he did quality work, but something happened. All the content I wrote and nicely organized was botched up and pasted on these PBNs. I made a couple attempts at having it all corrected but it’s like my emails all of a sudden weren’t really read anymore. 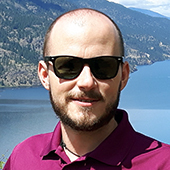 I was super disappointed because I went to great lengths to write the content myself – but in the end it was butchered so bad on his PBN sites that it looked downright spammy. I somehow KNEW Google would notice and punish me for it. And sure enough: A week later the post started dropping in rankings. It will recover with time, but still – the damage was real. No beef with the service provider, but I finally swallowed the fact I should have accepted a LONG time ago: Nobody will ever truly manage their PBNs to my high standards. I know Jon Haver does a pretty good job and so does Hatred, but even so… I’ve started to massively expand my own Private Blog Network (PBN) to never have to depend on other peoples’ PBNs again. I just realized that was my exact expense from last month, hehe. Cool! 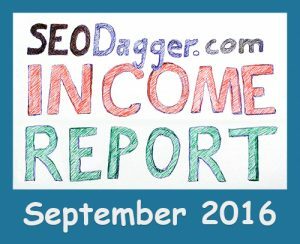 Going through all my previous income reports on this blog, I realized September was a record month for SEODagger.com. Meaning, it was the first time that it left me $255.76 USD in spendable cash. Nice! Considering I did even less work on it in September than I have ever done any other month (since publishing these income reports), I’d say it’s pretty darn good. I wonder what would happen if I just let it sit and never do anything with it again? Just teasing. In all seriousness though: I’m addicted to passive streams of income. Sure they take a LOT of work and upfront investment to set up, but once the income is flowing, it’s unbelievably satisfying. I spent a lot of time helping optimize my wife’s site (Leelalicious.com) in September. It wasn’t totally planned (although I have always helped with behind the scenes stuff), but she had a couple things go viral on her which resulted in a HUGE income month for her. It was by far her best month… ever. What excited me the most about it though was that close to 90% of her earnings were hands off. As in, she did not have to put in extra work to earn it. It certainly made her very happy, and of course I’m super proud of her! One could say September was so good to us that I almost forgot about this blog. I plan on changing that soon though! Last month I mentioned how I wanted to go back to doing regular posts (one per week) again but it simply did not work out. As is evident with this being the first new post since I wrote that, hehe. I do have a few plans lined up for SEODagger.com though. Most of it is scheduled for the new year (2017). Mainly because other niches tend to be more profitable during the last quarter of the year – my wife’s food niche being a good example – so the plan is to focus heavily on making the last few months of 2016 as profitable as possible before focusing more heavily on this blog again. Intentions are always good – for sure – but let’s see how things will actually progress. How did your September do? Love reading your posts and updates! Thanks for always sharing.